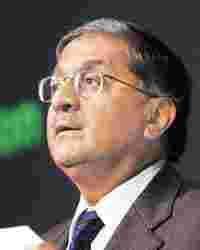 R. Gopalakrishnan, executive director of Tata Sons Ltd and chairman of Rallis India. The Tata group’s agrochemicals company, Rallis India Ltd proposes to enter the lucrative drugs and pharmaceuticals business by undertaking custom manufacturing, or production service outsourcing business, projects for international clients. With this proposal, the company is expected to supply pharmaceutical intermediates and active pharma ingredients to global drug makers. Said Rallis managing director V. Shankar: “Our new international business expansion plan includes contract manufacturing of pharmaceutical ingredients and drug intermediates. Since we have the capacity and technology capability for a wide range of chemicals, it would be a strategic business to look at in the overall scheme of expansion." The Tata group, after exiting the pharmaceutical business by selling two companies—Merind Ltd and Tata Pharma Ltd—to Wockhardt Ltd in the late 1990s, followed it up by divesting Rallis’ pharma business to Shreya Impex Pvt. Ltd in 2001. It had recently announced its interest to enter the area of bio-tech applications in the pharmaceutical industry and drug research. As part of the new life sciences business strategy, the group’s flagship company, Tata Industries Ltd, invested in the Bangalore-based genetics research firm Avesthagen a few years ago. Subsequently, the group had invested in the Hyderabad-based Indigene Pharmaceuticals Pvt. Ltd, which has been developing molecular combinations that work at multiple levels simultaneously to tackle illnesses. A prospective drug from Indigene that targets respiratory ailments is currently in the advanced stages of clinical trials. The group is also a major investor in the Bangalore-based Advinus Therapeutics Pvt. Ltd, the country’s first dedicated drug discovery company. The group’s software services company, Tata Consultancy Services Ltd, currently has a health-care technology arm which recently developed a gene-based breakthrough technology to fight malaria. And Tata Chemicals Ltd, which set up an innovation centre in Pune last year, has initiated key research projects based on biotechnology as well as nanotechnology that have wider applications in the pharmaceuticals industry. Though the Tata group’s plans for the life sciences business currently span six companies that are either part of it or affiliated with it—Tata Chemicals, Tata Consultancy Services, Rallis, Avestha Gengraine Technologies Pvt. Ltd, Advinus Therapeutics and Indigene Pharmaceuticals—none of these companies are currently present in contract manufacturing. As part of aggressive international business expansion, Rallis India, which focuses on agrochemicals business at present, is looking at strategic acquisitions and licensing deals.